Home » Summer » What’s the story Morning Glory? Vines and vineyards have a rich storied history. From the Middle East to France and beyond there is evidence of wine production dating back to 4,000 BC and beyond with numerous Biblical references celebrating vines…..talk about “Da-vine” intervention. I use grapevines on fencing in my yard, not for the production of grapes, but rather the aesthetic feel it provides in my landscape. The same can be said for Hops (Humulus lupulus). With the interest in craft beers, growing hops not just for production but their ornamental qualities has become popular. Hops are an herbaceous perennial easy to grow. Provide sunlight and plenty of support and by August and September the presentation of foliage and “nuggets” (hops) can be quite spectacular! Hops like a rich, well-drained soil, so till deeply with good organic matter for best results. The list of vines you could try in your yard is extensive and fun. If you don’t have a lot of yard space going vertical may be just the answer to create an intriguing enjoyable landscape. From Climbing Hydrangeas to Trumpet Vine, Honeysuckle to Wisteria, you may find you have to apply “tough love” and at some point slow their growth to encourage blooming via root pruning. A vine wants to grow and grow sometimes in lieu of producing blooms. In those cases some root pruning or stress will show the vine who is boss and get it to bloom. Remember vines grow. It is their “nature”. Provide sturdy support structures with a tendency to “overdo it”. Here are some vines I suggest you try in your landscape to get growing. • Wisteria. Make sure to have a strong structure for this vine with plenty of room to grow. A Wisteria can swallow a structure or building but planted in the right place the blooms and results are stunning. • Clematis. 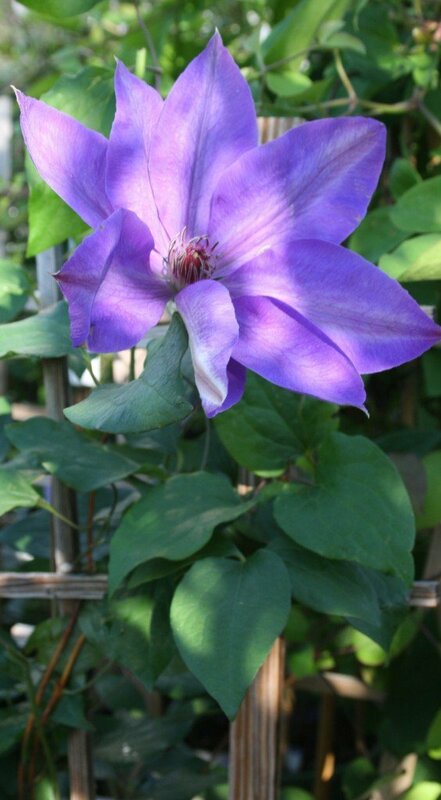 The key to Clematis is “cool roots and hot tops” Mulched at the base and with organic matter in the soil in a sunny area the flowers are simply gorgeous. • Climbing Roses. Heavy feeders that need sunlight and support, if given these three elements a climbing rose can provide floriferous results for years to come. • Honeysuckle. 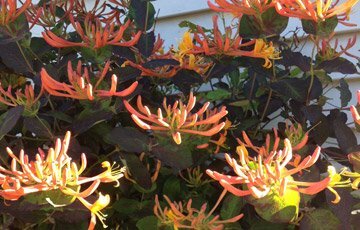 With sweet yellow to orange and red blossoms this easy growing vine will attract pollinators, butterflies, hummingbirds to your landscape. Prune back hard in fall and the following year watch it grow! • Climbing Hydrangea. With white lacecap blooms in summer and aerial rootlets this vine is a “clingy” must in the aerial landscape with glossy green foliage. • Hops Humulus lupulus. An herbaceous perennial that is ornamental in summer and has broad interest due to the craft beer industry. • Passion Vine Passiflora. For exotic blooms this might be your vine. Not hardy in most areas of Michigan (herbaceous habit surviving in zones 6 or warmer) don’t let it keep you from trying this vine for its intriguing blooms. • Morning Glory Ipomoea. What’s the story morning glory? Easy to grow from seed in warm weather this vine has adorned many mailbox posts and lampposts in its day. A tender annual its tendrils are fast growing and adept at pirouetting. • Moonflower. This tender annual vine has unique unfurling white blooms perfect to be used on decks where evening entertaining will take place. With moonflowers as well as Morning glories go easy on the nitrogen fertilizer (which grows more foliage). Supplementing with some high phosphorus will encourage blooming in lieu of foliar growth.